“Transustanziazione,” by Giovanni Gasparro. He’s one of the best Catholic artists working today. In my parish, as in most, the Solemnity of Corpus Christi has been moved from its traditional spot on the Thursday after Trinity to the following Sunday. There are many unfortunate implications of this liturgical change, but today I’d rather focus on what grace I received from the readings and prayers of today’s Ferial Mass. I’d like to start, however, with a painting, “Transustanziazione,” by Giovanni Gasparro. 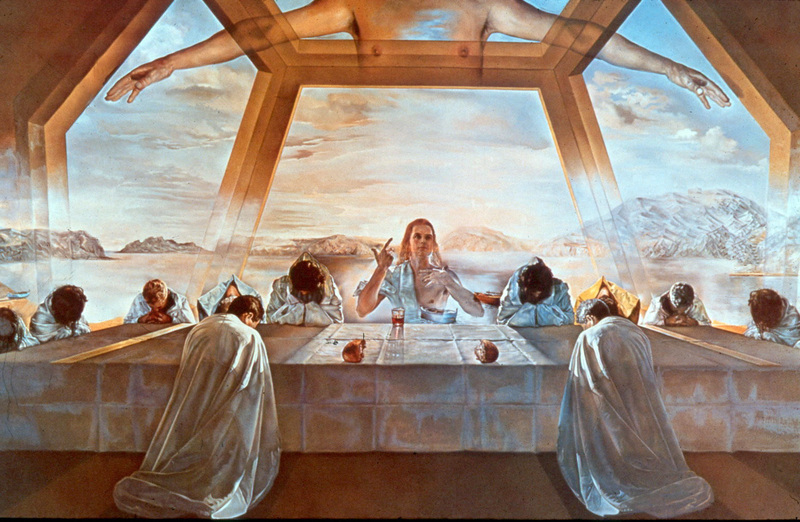 Only in the work of Salvador Dali do we find a modern artist who captures the mystical dimension of the Eucharist in such an original way. 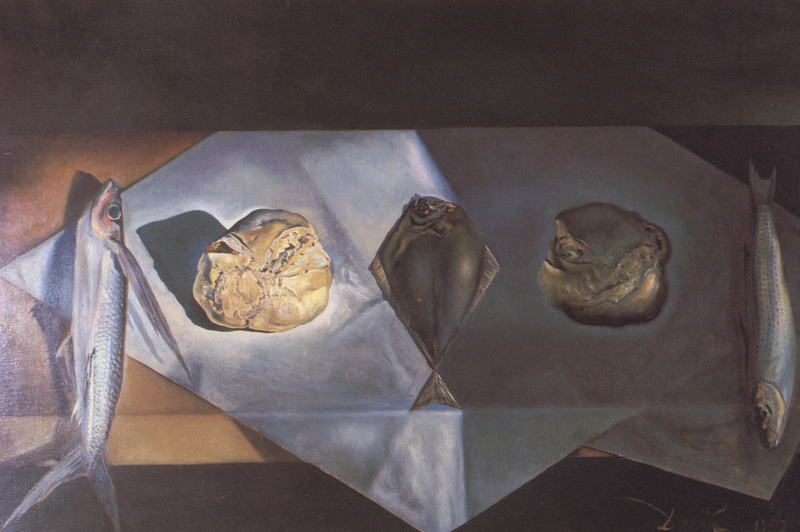 And Gasparro’s piece is far simpler, and therefore more visually striking, than any of Dali’s several Eucharistic paintings. Three pairs of hands, like the three pairs of wings on the seraphim and cherubim, bear aloft a bleeding host in undifferentiated space. The three sets of hands appear the same—they are, perhaps, the hands of the same priest captured over the lapse of time. This distortion of time and space lends the image a sense of eternity. We are viewing something transcendent. The Eucharist is not just an earthly event. It is also a rite which happens forever in the cosmic liturgy of heaven. And who is the Great High Priest offering that liturgy for us mortals? Who but Christ? In Gasparro’s image, Christ is present as priest and victim. The three pairs of hands also remind us of the Trinity. When we approach the Eucharist, we truly approach the Triune God. At every Mass, the act of Transubstantiation only happens because of the work of the whole Trinity. Christ offers Himself to the Father in the Holy Spirit, through the hands of His priests and the prayer of His bride, the Church. It is meet and right that we should consider the painting at this point between the Ordinary Form celebrations of Trinity Sunday and Corpus Christi. The painting has a certain sacramentality, in that, like the liturgy, it captures something of the invisible and manifests it to our earthbound senses. Looking at Gasparro’s painting, we have the sense that we are glimpsing something profound, unsettling, and sacred—something ordinarily hidden from us. Do we not hear the words of St. Thomas’s Corpus Christi hymn, Lauda Sion? Brothers and sisters: To this day, whenever Moses is read, a veil lies over the hearts of the children of Israel, but whenever a person turns to the Lord the veil is removed. Now the Lord is the Spirit and where the Spirit of the Lord is, there is freedom. All of us, gazing with unveiled face on the glory of the Lord, are being transformed into the same image from glory to glory, as from the Lord who is the Spirit. Therefore, since we have this ministry through the mercy shown us, we are not discouraged. And even though our Gospel is veiled, it is veiled for those who are perishing, in whose case the god of this age has blinded the minds of the unbelievers, so that they may not see the light of the Gospel of the glory of Christ, who is the image of God. For we do not preach ourselves but Jesus Christ as Lord, and ourselves as your slaves for the sake of Jesus. For God who said, Let light shine out of darkness, has shone in our hearts to bring to light the knowledge of the glory of God on the face of Jesus Christ. This, from the Second Epistle to the Corinthians. The Liturgical Providence of God permits us to hear these words of the Apostle on a day which, in the Old Calendar, was the preeminent feast of the Eucharist as such. All Thursdays are to be read in light of the Eucharist, mystically tied as they are to this holy feast and to Maundy Thursday. Russian icon of The Holy Face of Jesus “Not-Made-by-Hands”(Source). St. Paul is doing many things in this passage. It is an extremely rich vein of mystical insight, and it could yield untold spiritual fruit. But one very clear move that St. Paul makes here is the parallel he draws between our faces and the face of Christ. As the Spirit has removed the veil of sin from our faces in Baptism, so too, He removes the veil from Christ’s priestly face in the Eucharist. In the Eucharist, the Baptized stand face-to-face with God Almighty. We must grow in the likeness of Christ’s Holy Face—”from glory to glory”—but only by approaching the glory of that face in the Eucharist. What does this transformation practically look like? The readings give us hints. Eucharistic community is characterized by peace. Its members govern their actions by deliberate and conscientious love. We are obliged to strive for this peace. What, precisely, is the nature of this union of heaven and earth? Here, too, the Psalm furnishes a deeper insight. We sing in the refrain, “The glory of the Lord will dwell in our land.” There are many meanings bound up in this line of Holy Scripture. Three are immediately relevant to our purposes. The passage’s Sophiological meaning is that God’s glory will ultimately interpenetrate, indwell, and crown the redeemed cosmos. The passage’s Mariological meaning is that Christ will give His own divine-human self to the Church, the New Israel, through the Church’s perfect microcosm and icon, Mary, the true Daughter of Zion. 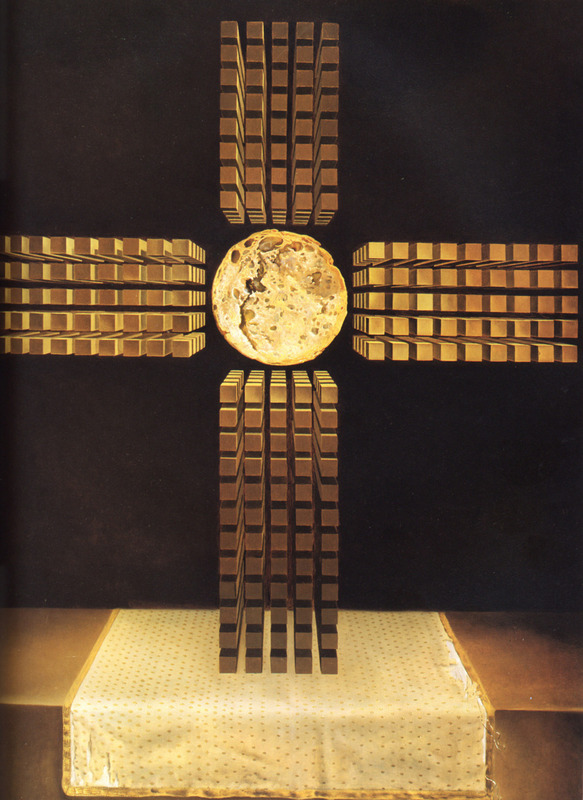 But the passage also has a Eucharistic meaning. There is a reason we are meant to chant this particular line of the Psalter on the Thursday that was (and at some level, still is) Corpus Christi. The Glory of God will dwell in the land by its fruits—bread and wine. Indeed, the Glory of God will so fill the bread and wine that they will cease to be bread and wine. God will pour out his glory upon our offerings until our “cup runneth over.” They may appear all the same to us, but in truth, they will become the Body and Blood of Christ. No part of their original essence will remain. This single act of outpouring and indwelling is God’s privileged path of union with souls and with all creation. As the great theologian Jean Daniélou writes, “We have already seen the Eucharist as communion, covenant. Now we see it as presence, shekinah.” It is the same presence that animates the entire liturgy of the Ferial Thursday after Trinity and that hides quietly in the simple and sacramental art of Giovanni Gasparro. Inspired by and borrowing from Artur Rosman’s similar post, I offer you some Pentecostal poetry. “God’s Grandeur,” by Gerard Manley Hopkins S.J. Sacred clusters pouring from ethereal bowers. It comes into your bosoms a sparkling, cooling flood. Around your purpl’d locks a crown of life entwining. Since Thou, lest they should falter, mak’st wine a torch to guide? Throughout the Latin Church, Saturday in the Ascension Octave is kept as the Feast of Our Lady of the Cenacle. On this holy day, we remember the Mother of God keeping vigil with the Apostles in the Upper Room, or “Cenacle.” The place is significant. Here, Christ gathered the Twelve on the night of his betrayal, Maundy Thursday. At that time, He instituted the priesthood and the Eucharist. Later, on Pentecost, the Holy Spirit will descend upon the congregation and truly constitute the Church as such, confirming its sacramental essence and mission in the world of time. Mary’s position in this unique place at this unique time is captured in the title, “Our Lady of the Cenacle.” But that name conceals a much deeper mystery. What, precisely, was she doing in the Cenacle? Why was she there? And does her presence, never mentioned in the Bible, nevertheless retain important meaning for us today? As with any mystery unspoken in Scripture but passed on to us by the Tradition, we can approach it by many paths. One of the wonderful things about the Church is that, in her sacramentality, she recasts everything in the light of Christ and opens all things to a deeper meaning than we ordinarily encounter. So today, I’d like to consider Our Lady of the Cenacle through art. Specifically, iconography. 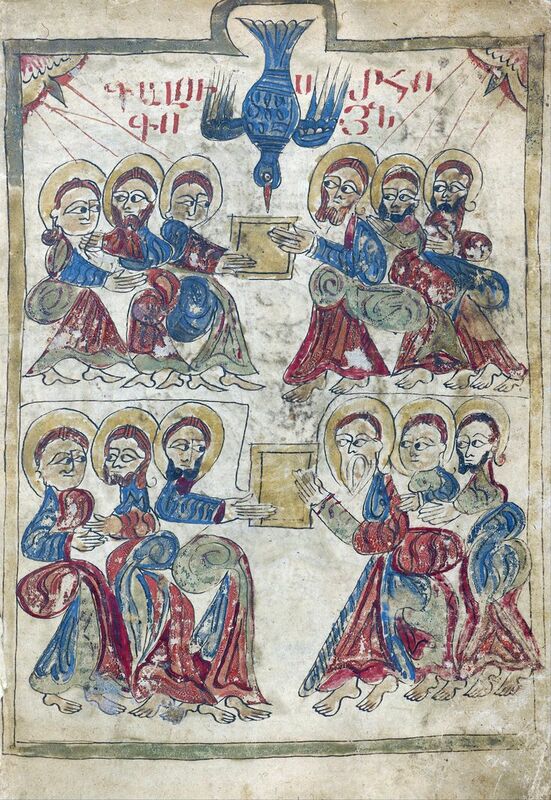 Even more specifically, Armenian illuminated manuscripts. In the Greek iconographic tradition, Pentecost is usually depicted with an empty seat in the center…the place of Christ the King and Teacher, who has ascended and sent the Holy Spirit in his stead. The icon for the feast of mid-Pentecost dovetails with this custom, as it depicts Jesus the youth instructing the teachers of the Law in an arrangement that approximates that of Pentecost proper. The Russian and Slavic iconographic tradition largely copies this model, with one notable exception. Many Russian iconographers include the Mother of God in what would ordinarily be the empty “Teacher’s Seat.” As one writer puts it, “Mary is therefore shown in the ‘teacher’s seat’ as the best example we have, and the person on earth who most resembled Jesus Christ (both physically, as His mother, and spiritually as His disciple).” Indeed. Figure C. A Russian-style icon with the Mother of God in the “Teacher’s Seat,” date unknown. (Source). The Armenian iconographic tradition differs from both the Greek and Russian streams in important ways, not all of which we can get into here. For our purposes, it is enough for us to observe that the Armenians have a tendency to place the Mother of God at the center of the Pentecostal scene. Examine, if you will, the illumination at the top of this essay—Figure A.
Mary is, by far, the largest character. The Apostles crowd around her on both sides expectantly. Her hands are lifted in the orans position of prayer. She stands in a red mantle and a dark blue robe that matches the hue of the Holy Spirit alighting above her. Every one of the bird’s tongues of flame move through her nimbus to reach the Apostles, some of whom even raise their own hands as if to reach out and take hold of the mystical fire. Mary is the central pillar of the icon. The Holy Spirit does not just descend, but rests upon her as He sends forth his tongues of flame. Here, too, their colors match. We can see that the Holy Spirit is customarily written in blue for this festal icon. Blue is an interesting color, one with mystical associations. I won’t attempt a full symbolic analysis here, but it is worth contemplating the range of natural and supernatural meanings which Christianity has invested in this delicate shade. It suffices to say that blue is a sophianic color, calling to mind the wisdom and beauty of God (see the pertinent chapter in The Pillar and Ground of the Truth, by the great Russian theologian Father Pavel Florensky). The iconographic tradition is of great help in this subject as well; besides gold, blue is the only other color allowed for the background of icons in the Greek and Slavic canons. Figure F. Pentecost icon of unconfirmed but probably Armenian origin. Same blue Spirit, roughly the same placement of the Theotokos. (Source). It is also perhaps worthy of note that in Figure D, Mary doesn’t just match the hue of the Spirit. The colors she wears also match the architecture of the Cenacle. She is one with the Cenacle; the Cenacle is hers, and hers alone. The Cenacle is the Church, the Cenacle is every tabernacle in the world, the Cenacle is Heaven, the Cenacle is the New Jerusalem, the Cenacle is the Throne of God, the Cenacle is the Eschaton, the Cenacle is the final consummation of sophianic being brought about by Christ’s gloriously triumphant Incarnation, sacrifice, and Resurrection. And in all these mystical dimensions of the Cenacle, Our Lady is Queen. Mary is the woman who bears the Holy Spirit, the living icon of the Church. When we look at Mary, we are to think of the Spirit. The Mother of God always points us to her son, but also to the Holy Spirit, and through both, to the Father. She is never apart from the Holy Spirit. They abide together, and the Cenacle is where her truly Eucharistic and sophianic state of being is manifested for the awe-struck view of the whole Church. She is the consummation of what is accomplished by the Trinity in the Cenacle, the woman who fully cooperates in the salvation of the world, the Co-Redemptrix and Mediatrix of All Graces. Indeed, do we not read the latter title in the first illumination above? Do we not see it in the slim orange lines of fire that move through her halo to the Apostles below? They only receive the Spirit as it passes through Mary. Mary does nothing of her own effort. God does all in her, and she freely agrees to accept and work for God’s will. St. Paul can speak of “those things that are wanting of the sufferings of Christ, in my flesh” (Col. 1:24 DRA). Not so with Mary. In her, the cross’s victory is complete. In her, it has become the Tree of Life, “so that the birds of the air,” such as the blue bird of the icons, “come and lodge in the branches thereof” (Matt. 13:32 KJV). On this feast day, let us remember the manifold graces that Our Lady showers upon us from her throne in the eternal Cenacle. Let us also take heart that, with so powerful an advocate at the heart of the Church, no controversies or troubles can ever overwhelm the Barque of Peter. Finally, let us pray to Our Lady of the Cenacle for the Benedictines of Silverstream on this, their patronal feast.